This is, in essence, a sampler, and the list price is equivalent to that of a single full-priced disc. No texts and translations are included, and there is nothing of substance in the booklet about the performers or the music, except for a brief and general essay about opera. The performances are taken either from complete recordings or recital discs. (A few appear to appear for the first time in this collection.) 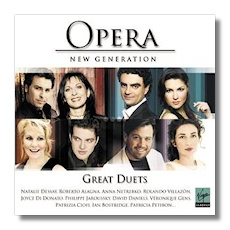 In other words, this release is much like its predecessor, "Opera - New Generation: Greatest Arias." Nevertheless, there are some very weird programming choices here. The scene from Dido and Aeneas – not really a duet anyway – is hardly a greatest hit. (Instead, it should have been followed by "When I am laid in earth," which most certainly is a greatest hit.) Similarly, there are far more engaging duets in La Grande Duchesse du Gerolstein than what we are offered here. Also, it must be said that an awful lot of what has been included here isn't opera, despite the title of this collection. (I suppose it refers not to opera per se but to opera singers.) The inclusion of Rossini's famous "Cat Duet" was inspired, though, particularly as the final selection. There also are a few oddities in terms of the performers and the performances. Note that this is a "new generation" collection, which appears to mean that the singers are, relatively speaking, young'uns. Arleen Auger has been dead since 1993, however – like Lucia Popp, who also died in 1993, a victim of brain cancer. Furthermore, Felicity Lott and John Aler were born in 1947 and 1949, respectively. In the classical music world, "new" is a relative term! The performance of Stolzel's touching "Bist du bei mir" (once attributed to Bach) by Natalie Dessay and Roland Villazón is endearingly wrong-headed. The former does her best Kathleen Battle imitation, and the latter emotes as if he were singing "Che gelida manina." His Monteverdi is similarly quaint. (Gotta love that voice, though.) In the duet from Benvenuto Cellini, Gregory Kunde sounds stressed, making one think longingly of Nicolai Gedda. And that pretty much sums up this collection: the performances heard here range from the pretty good to the great, even if they might not erase memories of the "old generation."